Workspace Usage Reports are a series of reports designed to give administrators an idea of the amount of activity a particular workspace is producing. To access these reports, log in to a workspace and click Settings > Usage Reports. All reports can be exported as CSV files as well. Note: Only Company or Workspace Administrators have access to these reports. Members by Last Login: see when each workspace member last logged in and viewed the workspace. Page Views by Day: see the collective daily views of a workspace. You may also filter by date range and choose to exclude yourself from the results. Page Views by Month: see the total page views of a workspace in a given month. Activity Log Report: view all activity in a workspace for a given time period in the same format as the Recent Activity Application Block. 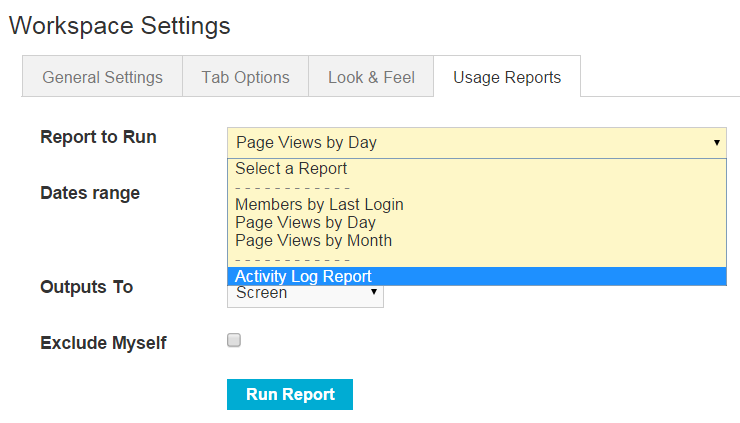 You can delete activity logs when running a Recent Activity Log Report to remove activity from My Dashboard or any Recent Activity Application Block. Note: Both Company and Workspace Administrators can access workspace usage reports. Only Workspace Administrators can delete activity stream records. To access these reports, log in to a workspace and click Settings > Usage Reports. All reports can be exported as CSV files as well.